Stewart, Cal and I are just back from the O’Reilly Emerging Tech conference, where Cal and Stewart did a couple of presentations. One of the cool things there was this screen put together by Greg Elin of Fotonotes fame, who is responsible for us adding the annotations you can make on Flickr photographs. 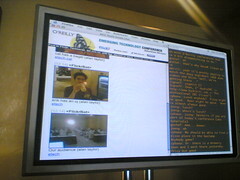 On this screen, projected live, you could see anything tagged “etech” or “etech05” on Flickr, del.icio,us, and Technorati.